It is the year 2184. Evil corporations have taken over the world and installed neon lights everywhere. 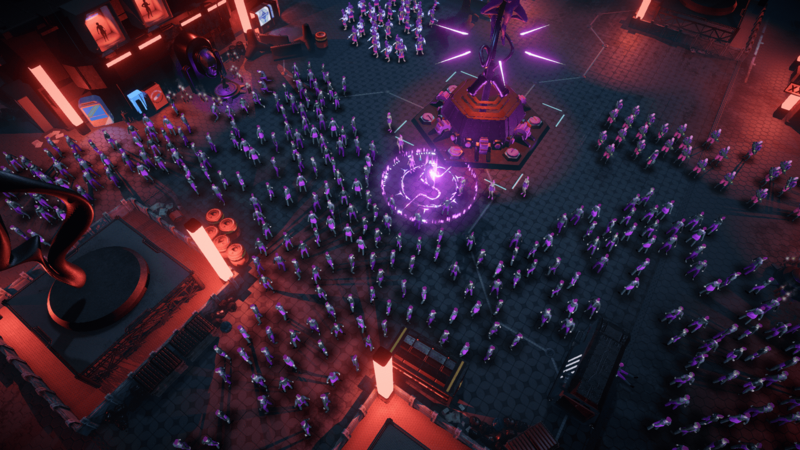 As a self-declared cult leader, It is up to you to liberate humanity in Re-Legion, developed by Ice Code Games and published by 1C Entertainment. Re-Legion’s basic idea is pretty neat: you are a cult leader, back in the City, and frustrated about people being led like sheep by soulless companies. You decide to take things into your own hands, start to recruit followers, and build a cult to establish a new order. Behold the eternal neon lights of the City. This concept also describes Re-Legion’s gameplay. As the Prophet, you convert civilians into followers, which each occupy different roles. 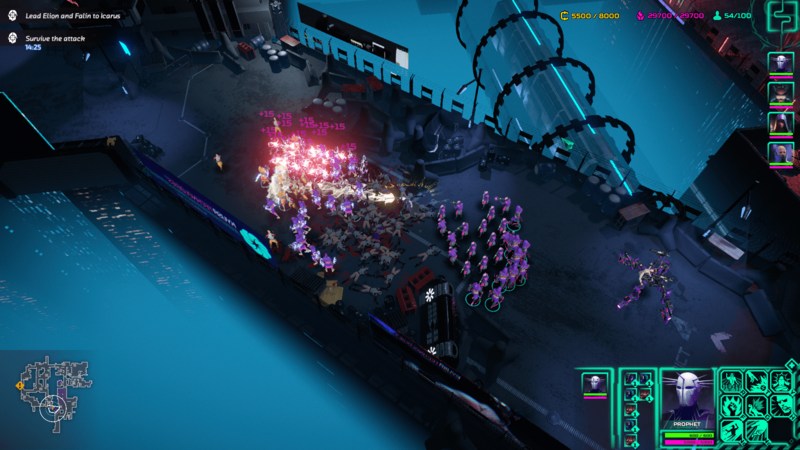 Some serve as frontline cannon fodder, whereas others are healers, provide artillery support, or hack away to gather extra resources or set up defence turrets — Re-Legion is set in a cyberpunk future, after all. 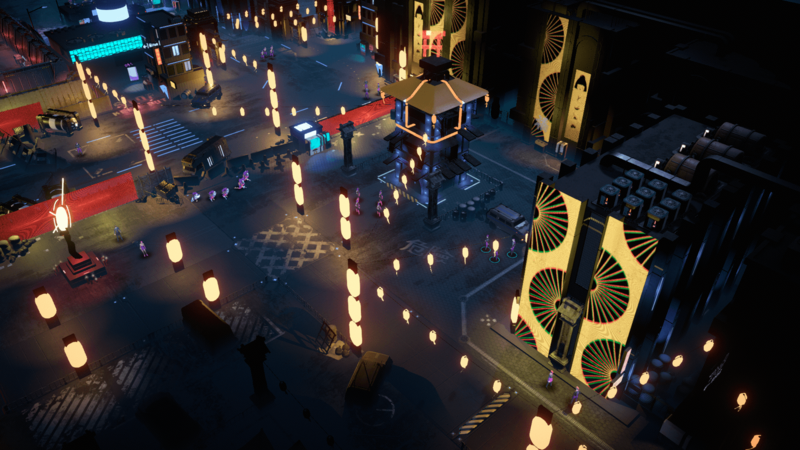 While your cult does have a headquarters, and tech buildings can be found on many maps, there is no true base building in Re-Legion. That is the point: humans are supposed to be your one resource and the focus of your efforts. Unfortunately, this premise falls somewhat flat. 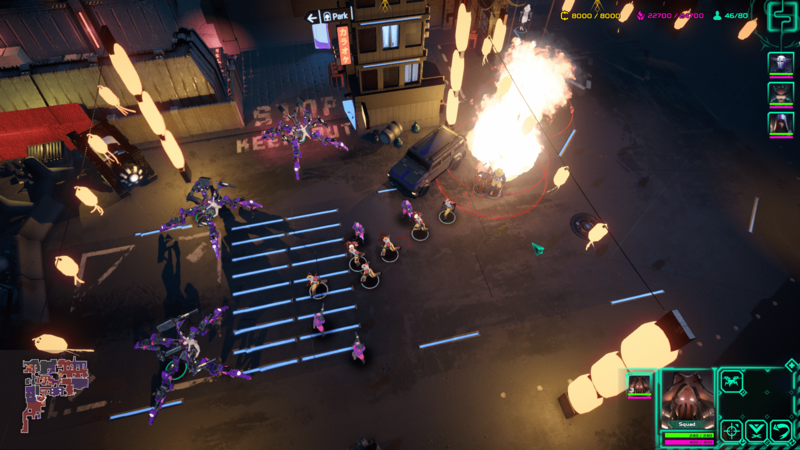 As a general rule, followers are just foot soldiers to be thrown into the meat grinder, and a lot of grinding is needed to win against enemy drones, police robots with miniguns, and other foes. There is no careful squad management; followers are recruited, promoted, and thrown away, which is ultimately not that different from mass training them at a barracks. Most of your followers are expendable; only your heroes need to survive. An exception are the hero units. In addition to the Prophet, you are provided with a healer, a hacker, and a fighter, covering the four main categories of units. Unfortunately, the heroes primarily serve to advance the plot. Only the Prophet is truly useful, and maybe the healer. Using the others is even discouraged, as they easily disappear in the crowd — and losing them prompts a game over. Clashes with the premise aside, the units themselves are fairly well-balanced. Mixing units is highly encouraged, avoiding an old RTS trap in which spamming one units is sufficient to win the day. There is a cap on how many units you can control, making army composition even more important. Not even half these guys are going to survive this. While combat is Re-Legion’s strongpoint, the game unfortunately falls flat in a couple of other categories. The cyberpunk setting is largely window dressing. Aesthetically, it is well-executed, but past that, it has little to offer but evil corporations, hackers, and eternal nighttime. The story, initially presented in a fairly serious tone, degenerates over the course of the campaign. The main antagonist is almost a cartoon villain, and religious themes are left unexplored. The campaign itself is of decent length, featuring nine missions that can be completed in about ten to twelve hours. Replay value is mostly absent — there is no multiplayer or skirmish mode. A short while into the campaign, you can pick from a couple of different cults, but their differences boils down to altered statistics. At times, Re-Legion feels a bit clunky. There are some pathinding issues, units glitch through objects, and female cultists turn into men when promoted. A number of bugs and technical issues come on top of that, though the developers have ironed out the worst ones and total crashes are significantly less frequent than they were right after launch. At the end of the day, Re-Legion is a mixed bag of good ideas and missed opportunities. It remains an entertaining little strategy game, but fails to move beyond its initial premise while still delivering a couple hours worth of entertainment. Re-Legion is available now for PC. Cool concept. Maybe I’ll try when it goes to free on steam? It’s definitely worth checking out when it becomes affordable to you. Re-Legion’s main weakness is ultimately not lack of quality, but unrealised potential.